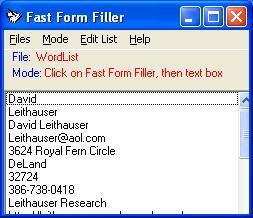 Fast Form Filler is a software program for Windows 95/98/Me/2000/XP/NT/Windows 7/Windows 8 computers that saves you time typing routine information into forms, both on the Internet and in programs. It allows you to store a list of phrases, such as your name, address, credit card numbers, email address, or passwords. It then displays a list of all stored phrases on the main screen. By simply clicking on the phrase you want and then clicking on the input box on a Web page or program where you want to type the phrase (or the other way around), you can have Fast Form Filler type the phrase for you. This can save you many hours of typing over the course of a year. It is also a convenient way to input passwords, provided nobody else has access to your computer. Fast Form Filler is available as shareware. Try it for a month to see if you like it before you have to pay for it. If you do like it, pay a one-time $10 registration fee (volume discounts available). Remember that complete instructions are provided for uninstalling Fast Form Filler if you decide that you do not like it. Fast Form Filler runs on Windows 95/98/NT/2000/ME/XP/Vista/Windows 7. Click here to download the installation program (fffarc.exe). Either select Run if you have that option when you click on hte link, or download the file, then run it by double clicking on the file in My Computer or Windows Explorer. contact Leithauser Research at Leithauser@aol.com or (386)-410-6769 and describe the addition features you would like to see in this program. If they sound like good ideas, we will add the improvements at no charge. Just part of our customer service! If you have any questions, please send email to Leithauser@aol.com. In case of emergency, you can call (386) 410-6769 between the hours of 11 AM and 5 PM Eastern time.